Greenhook Ginsmiths American Dry Gin is a popular Gin available from TheDrinkShop in 70cl to buy online. Visit TheDrinkShop for the best price for 70cl of Greenhook Ginsmiths American Dry Gin or compare prices on our other Gin products. Greenhook Ginsmiths American Dry Gin-made from Organic, New York State Grown Wheat, Tuscan Juniper, Coriander, Chamomile, Elderflower, Citrus, Thai Blue Ginger, Ceylon Cinnamon, Orris Root, and Elderberry. Greenhook Ginsmiths craft their Gin on a custom-made, Copper Pot Still, designed to work in conjunction with a Vacuum, which allows them to remove Air Pressure from the still during distillation. This technique, known as 'Vacuum Distillation', allows Greenhook Ginsmiths to distill their Gin at low temperatures and prevents the delicate aromas of their Botanicals from becoming stewed with excessive heat during distillation. This unique process creates a beautifully Fragrant Gin with lifted aromas and vibrant flavors unlike any other. Where to buy Greenhook Ginsmiths American Dry Gin ? Greenhook Ginsmiths American Dry Gin Supermarkets & Stockists. 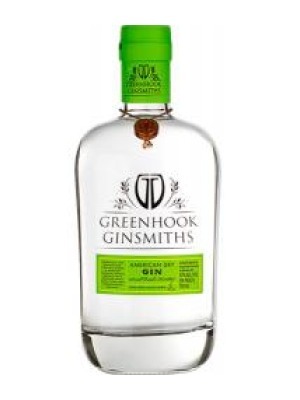 You can buy Greenhook Ginsmiths American Dry Gin online in most retailers and find it in the Gin aisle in supermarkets but we found the best deals online for Greenhook Ginsmiths American Dry Gin in TheDrinkShop, Amazon.co.uk, and others. Compare the current price of Greenhook Ginsmiths American Dry Gin in 70cl size in the table of offers below. Simply click on the button to order Greenhook Ginsmiths American Dry Gin online now.